But Jonah ran away from the Lord and headed for Tarshish. He went down to Joppa, where he found a ship bound for that port. After paying the fare, he went aboard and sailed for Tarshish to flee from the Lord. Jonah, I have a mission for you. Go to the great city of Nineveh and tell the people who live there that their sins have come to My attention. Me? Go to Nineveh? I don't want to go to Nineveh. Maybe I will run away. I will get on a ship and sail somewhere else — anywhere but Nineveh. Jonah falls into a deep sleep aboard the ship when suddenly . . . Excuse me, sir. Jonah, please please wake up! A storm, sir. We're afraid the ship will break apart in this wind. The captain sent me to ask you to pray to your God to help us. Jonah, Jonah, we think this storm is your fault! What terrible thing have you done to bring all this trouble on us poor sailors? Tell us. I am a Hebrew. I worship the Lord, but I am running away from Him and what He wants me to do. What should we do? We've already thrown all the cargo off the ship and it hasn't helped. We don't want to die. Pick me up and throw me into the sea. No, sir, we can't do that. Let's try rowing again. It's no use. We are going to have to throw Jonah overboard. Oh God of Jonah, please don't let us die. The sailors threw Jonah overboard and a large fish swallowed him up. While Jonah was in the belly of the fish, he prayed to God. Lord, my God, when I almost drowned, I called for help. And You listened to my cry. I will sing a song of thanks. I will do what I have promised. Lord, You are the one who saves. 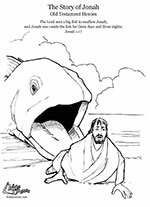 God hears the prayer of Jonah and causes the fish to spit Jonah out on the shore. Then Jonah keeps his promise to God and goes to Nineveh. People of Nineveh, I have a message for you from God. In 40 days, Nineveh will be destroyed because of your sins. Oh, no! We need to repent for our sins. We will wear black clothes and we won't eat to show God how sorry we are. Please, Lord God, turn away your anger. I will have compassion on you, and I will not destroy you. If you want to read more about Jonah and the people of Nineveh, check out the book of Jonah. It's in the Old Testament section of your Bible.